In the heart of the Mission District of San Francisco, across the street from where imported techies and new age hipsters crowd La Taqueria, lies the nationally recognized, community-based organization, the Mission Cultural Center for Latino Arts (MCCLA). The center remains an anchor for the neighborhood since opening its doors in 1977, despite accelerated gentrification in recent years and the resurgence of ICE arrests in the last few months. 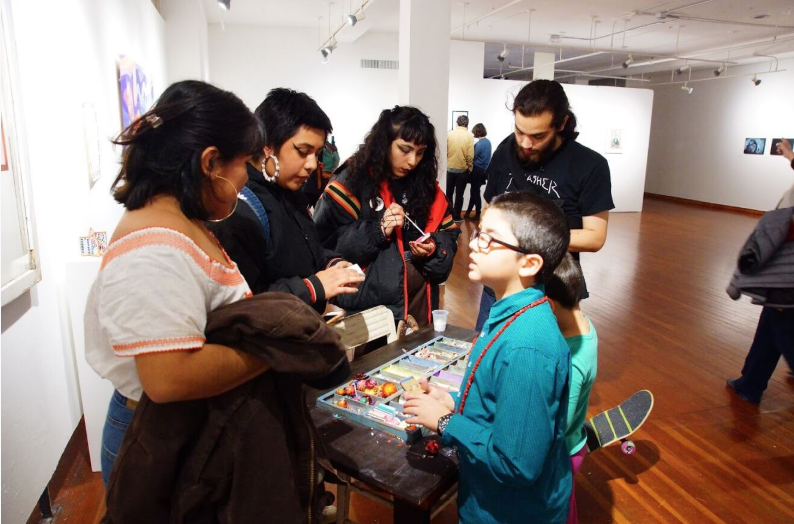 Through printmaking workshops and art classes, the center continues to focus on the preservation, promotion, and development of the traditions and culture of Latinx, Chicanx, Central American, South American, and Caribbean people that populate the neighborhood. Diffused Reflections intersects with numerous themes including, but not limited to, class, race, sexuality, religion, spirituality, gender, immigration, migration, self-representation, domestic life, family, and beauty. It provides a thoughtful and poignant look into the lives of these contemporary artists, particularly highlighting how they view themselves, their peers, and the world around them. It is a collective look into the implementation of art in resistance to false representations and stereotypes. Located on the second floor of the MCCLA, the Diffused Reflections exhibition is set up in a large white-walled room that allows for comparison and dialogue between the multiple artworks. Immediately one recognizes the variety of media, as the show is comprised of installation, photography, video, painting, zines, and works on paper. Many pieces contain references to Latinx, Chicanx, or Pre-Columbian visual traditions. 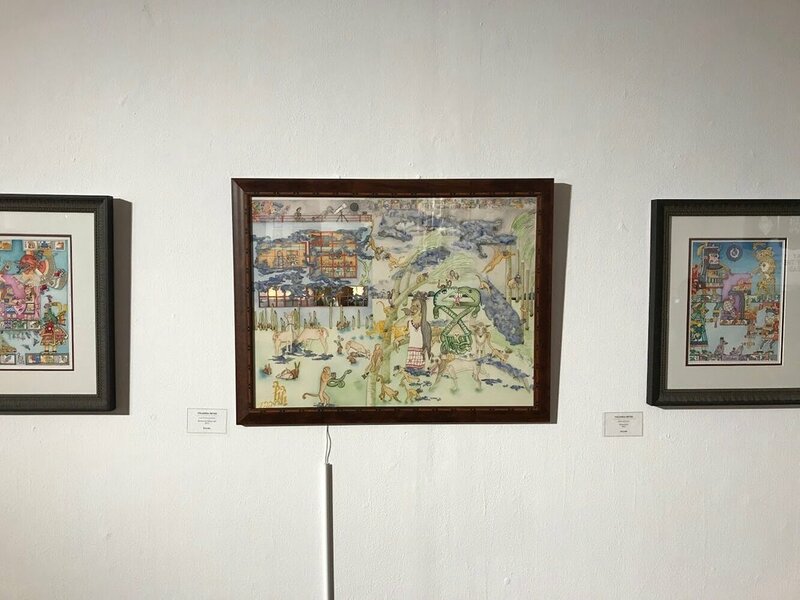 For example, Yolanda Reyes’ ethereal watercolor Las Chingonas (2017) features powerful female figures in Mexican history: Coatlicue (Mother of the Aztec gods), Frida Kahlo, Rosario Castellanos, and Comandanta Ramona. Memorably, the exhibition even includes the canonic pioneer of the Chicanx art movement, Ester Hernandez. Her dreamy multimedia drawing Rosie, La Pachuca (1944) looks out at the viewer wearing large hoop earrings, her hair ornate with razor blades. The term ‘rasquchismo’ appears in the work of Alejandra Pérez, part of the multidisciplinary artist collective Aguas Migrantes. Pérez’s artworks are personal and autobiographical in nature, using found or collected familial objects. Mesa [Mothers, Love & Dementia] (2016) an interactive piece featuring a homemade table with a letterpress drawer filled with various materials point to sentimental memories, heirlooms, as well as ingredients in medicinal healing. Such works highlight the poetic sensibilities and aesthetics of Mexican-Americans, yet what is most enjoyable in the exhibition is the cross-cultural dialogue with other women of color. This inclusion speaks to Del Toro’s dedication to highlighting various backgrounds and identities. For instance, Iranian artist Sanaz Jamloo’s haunting 2012 photographic series Insomnia examines dislocation and trauma following the Iranian revolution and Iran-Iraq War. Using photography as her tool, she studies the construction of narration, memory, identity, and femininity. Hair appears as signifier of identity in San Francisco-based artist Danielle Wright’s multimedia U Can’t Touch This (2016). Seemingly a pop culture reference, the letters of the phrase are pinned onto a framed tack board. However, with closer inspection one recognizes that each letter is made up of small spirals of dark curly hair. Likewise, in Wright’s Good Hair (2016) she seamlessly interlaces hair into textiles that spell out the words. With the conceptual strength of Lorna Simpson’s 1994 Wigs (Portfolio), Wright uses her hair to comment on the history of colonized black bodies. Diffused Reflections challenges conventions of white, heterosexual male representation, particularly Eurocentric conventions of beauty. 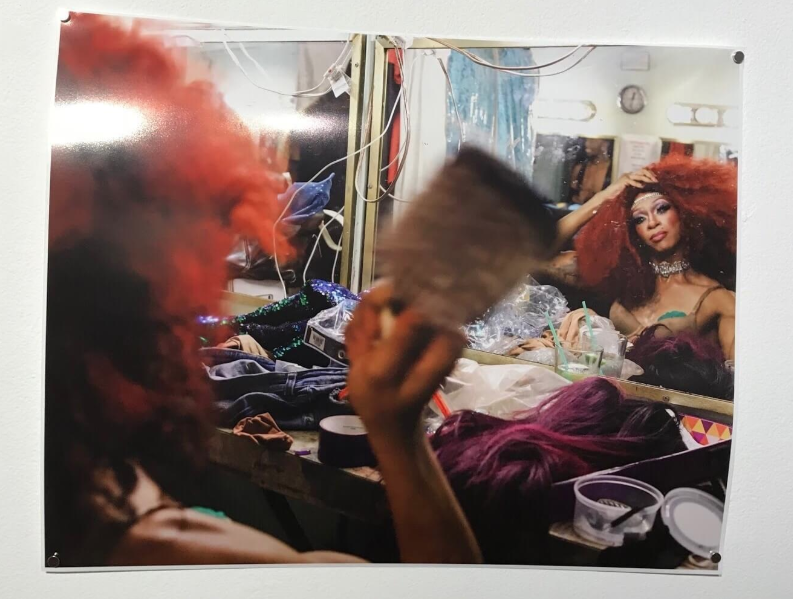 Jessica Ofelia Alvarenga’s photographic series Gender is Only a Performance (2017) is a stunning snapshot into the life of a Black drag queen, on and off stage. Breena Nuñez’s colorful comic book portraits make a vivid declaration as they feature strong, resilient women of the Central American and Afro-Latinx diaspora. Nuñez’s comic book strip They Call Me Morena… (2018) presents the artist’s internal dialogue when contemplating her definition of Latinidad as a femme queer Afro-Latina. A fascinating counterpart to these comics is the interactive Zine Library, made up of dozens of contemporary zines, or low budget self-published periodicals, beloved by punks and radicals. The viewer is allowed to pick up and read, or even purchase several of them in the Center. This collection provides a deeper, autobiographical view into the lives of contemporary youth, in works such as Alice Bag and Sophia Veláquez’s Beauty, Breena Nuñez’s Crocodile Girl, Xicanistas Punkeristas: An Anti-Coypright Zine Chronicling Xicana’s in Punk & Beyond, and Nopalita: Interior Monologue by Maritza Torres. Reading these zines gives you access to the innermost thoughts and reflections of these artists on race, sexuality, how the world is built, and more troubling, how society fails them. 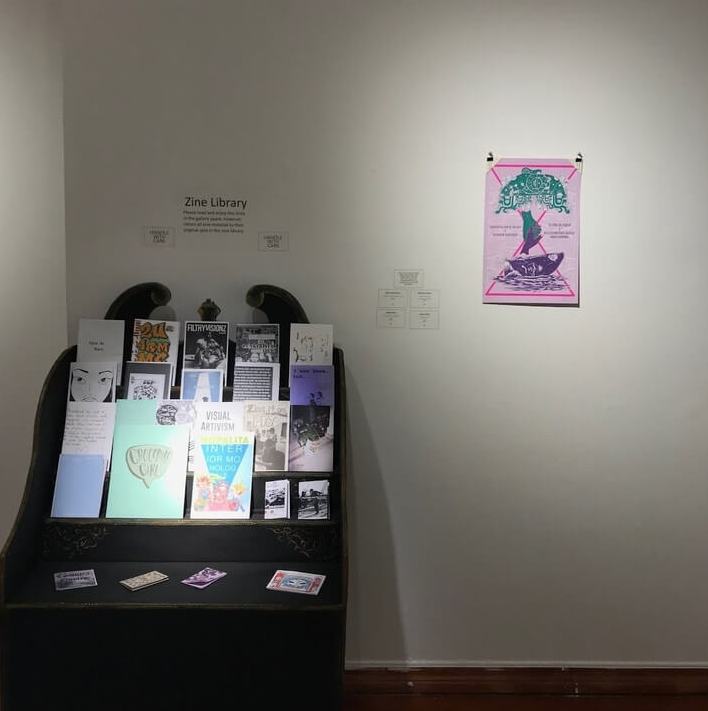 Zines represent a place where they can construct their thoughts, voices, and identities to be felt and heard. Given the current socio-political tension, it’s not a surprise that popularity of zines appears as an alternative to digital avenues for information. Analog data becomes material in Sasha Silveanu’s video tape installations titled My Mother’s Tapes (2017). Silveneau has taken her mother’s recordings of television broadcasts during the civil war in former Yugoslavia and removes the VHS ribbons to weave beautiful makeshift “tapestries.” Two tapestries are suspended in corner of the exhibition, while another large installation, approximately 5 feet wide, sits in the middle of the room. Each is charged with traumatic narratives between mother and daughter, family members, reporters, and countries. Del Toro offers a new platform for contemporary narratives with the presentation of new media. In the digital photo gif, Homegirls (2017), Itzel Alejandra Martinez documents the everyday adventures of two best friends. Photos portraying two cool, sunglass-wearing Latinas throughout their various activities are transfixed upon moving footage. The dynamic composition, using modern technology, is coupled with a diary of comradery, Latinx life on the El Paso-Júarez Border, but, most of all, freedom. Amidst current movements surrounding racial, feminist, and transgender civil rights, coupled with the president’s rhetoric of insulting immigrants from ‘shithole’ countries, this exhibition makes a socio-political statement regarding the agency of women and minority groups in the creation of their representation and value. When describing the exhibition, Del Toro indicates she envisioned the show as a “table moment,” or mutual conversation where all the artists could sit together to discuss and/or express their perspectives. “I imagined each of the artworks talking to one another, paired together, and each having a seat at the table; a place where all of us could talk, laugh, gossip, even cry together.” This eclectic exhibition invites the community to witness and share in profound narratives of strength, resilience, and survival for women and non-binary people in contemporary society. For more about the artists in Diffused Reflections, check out the exhibition catalogue.